EVER WANTED TO communicate directly with top writers? Your humble narrator is at a fabulous literary festival and will be delighted to pass on your questions and messages to the big name authors here. Kiran Desai, author of the hit novel The Inheritance of Loss, is here, and so are lots of other great writers. Check out the website of the Ubud Writers and Readers Festival for the full list. The picture above shows Kiran with festival director Janet De Neefe and yours truly at the festival. Thank you, Jakarta Post folk, who have given us great coverage. Kiran said that visiting Bali had the same magical feeling as winning the Man Booker prize, and it's easy to see the truth in what she says: it's like stepping onto a strange and wonderful new planet. Internet connections here are not as reliable or easy to find as they might be, so apologies that this website will not be updated as often as usual while I am on the road, but use the email link on the side (or the comment button below) to send questions or comments which I will be happy to pass on to the authors here. AN ASIAN AUTHOR has won an international deal. The Elephant and the Tree by Jin Pyn Lee was originally published by the National Book Development Council of Singapore -- not a common origin for a children’s book that wins recognition in the West. But I heard yesterday that it has been bought by US publisher Running Press for its children’s book division. The deal was brokered by the high active Sandra Dijkstra Literary Agency. The US edition will appear in Spring 2009. Jin Pyn (what a lovely name for a children’s book author) is a former Singapore Airlines flight attendant who is also an artist, a filmmaker and a wildlife activist. She deserves this success. Moral of this story: Start local. Go global. LEAKS FROM THE judges at the Man Booker Prize are always fascinating. Giles Foden, who is a lovely guy, spills some interesting beans about the closed-door discussions that are taking place. “If one looked only at literary style, Anne Enright or Ian McEwan would win,” he said in the Guardian. “If one considered books as nothing but psychological mechanisms, Mohsin Hamid would be the victor: The Reluctant Fundamentalist does subtle things to manipulate its readers. 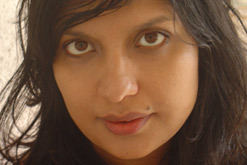 For implicit polemic and strong portrayal of character, however, Indra Sinha would be the choice. If it's strangeness and beauty you're after, look no further than Nicola Barker's Darkmans. Then there is Lloyd Jones, the supposed new favourite and (according to some reports) an 'unknown writer', whose Mister Pip would win if the sole criterion was the emotional impact of the story. I know I tend to repeat myself, but this is further proof that you don’t have to make it in London to make it in publishing. RICHARD OH, a writer/ filmmaker/ bookshop boss based in Indonesia, has been busy. His new movie The Lost Suitcase is being featured in the Hong Kong Asian Film Festival next month. MEANWHILE, Joshua Samuel Brown continues his inexorable rise. Many of my students will remember Joshua, a compact bundle of energy who added a powerful element of fun to meetings of a couple of our writing groups. He landed a contract with Lonely Planet almost immediately. Having finished his first book for them, he is in talks for more contracts. Joshua performs these miracles from an island off the coast of Taiwan that most people have never heard of. What further proof would anyone need that you can succeed from a distance? SIT DOWN. Let me tell you a story. If audio books are you’re thing, you’ll enjoy The Chopin Manuscript, a novel deliberately constructed for an audio serial. It’s special for another reason, too: it’s a group novel. It was started and finished by Jeffrey Deaver. Other authors filled in the middle parts, including bestseller Lee Child. 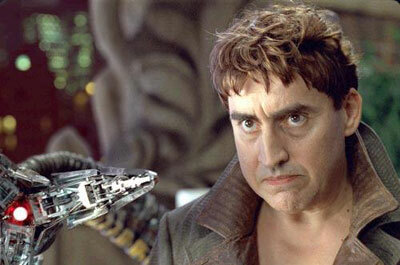 And there’s yet another thing that makes it special: they have a really good actor, Alfred Molina (Pictured: he played Doctor Octopus inSpider-Man 2), doing the reading. The voice is all-important. It will be launched on www.audible.com later this month, growing by two chapters a week. TWO ASIAN AUTHORS are mopping their brows after having made it to the shortlist of the Man Booker Prize. Mohsin Hamid and Indra Sinha are in the finals. There was general rejoicing among the Asian literati after the Booker folk announced their most Asian longlist ever -- as well as the two above, we had Nikita Lalwani and Tan Twan Eng, so four out of 13 were Asian. Mohsin, despite being relatively young in the game, is a star performer: he’s highly educated and writes intelligent, moving books. 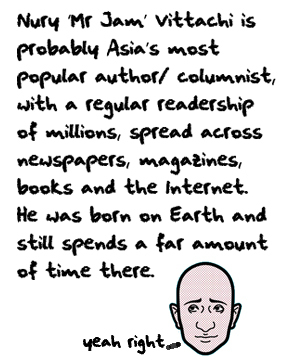 He’s also lively company: we shared a curry at the Sydney Writers festival earlier this year. Indra is a Bombay guy with an advertising background and a penchant for international travel. He lives in France now and has a good website. Why is there such a preponderance of Asian authors on the Booker list? Actually, there’s not really a preponderance. The list has been going for 39 years, and there are not many Asian names on top: VS Naipaul won it in 1971, Salman Rushdie won it for Midnight’s Children in 1981, Romesh Gunasekera came second in 1994; there was Arundhati Roy in 1997, and Kiran Desai is the current holder. You could also sort of count Michael Ondaatje (1992) who is Sri Lankan-born. Out of all those, only one -- Arundhati Roy -- is a writer living and working in Asia. There have been lots of Asians on the shortlists -- such as Rohinton Mistry and Anita Desai. Sometimes books which have Asian themes but are not written by Asians are celebrated by the prize: Paul Scott won it for Staying On in 1977; and I think JG Ballard may also fall into this category. There's room for some new ones! THANKS FOR THE great feedback you sent me from yesterday’s piece. Clearly there are lots of creative, talented people in this community, and there’s an element of frustration at the fact that so much rubbish from obviously untalented people gets produced. Well, I’m here with a message. YOU CAN WRITE A TV SHOW OR NOVEL THAT MAKES THE CUT. It doesn’t matter who you are or where you live. AUTHOR WILLIAM DALRYMPLE had to get medical help after an accident in India, I heard this morning. He had several stitches inserted into his head. "I had an argument with a boat on Lake Pichola," he said. Dalrymple is one of the most acclaimed authors of historical non-fiction and a really fun person to hang with. Lake Pichola is a glorious stretch of water in Udaipur, Rajasthan, with a palace in the middle. Oh well, if you have to rest and recover from an accident somewhere, Willy, Lake Pichola is a good choice. THE CHINESE equivalent of the Just William books have been snapped up by Harper UK and Harper China, I heard. The series is by Yang Hongying. Naughty Ma Xiaotao is a series of books about a boy and his father who are always getting into awkward scrapes. Harper has bought eight volumes for publication beginning in 2008. Mainland book sales figures are often unreliable, but this series has definitely had a major measure of success. It is said to have sold more than 10 million copies in China, according to Publishers' Marketplace. READER LIZ VERBRAAK, a writer of fantasy stories, wrote with a question from her father. Where do the Blade of Grass stories come from? These little Zen-flavoured tales are scattered throughout my Feng Shui Detective novels. Well, Liz, the ones in the first couple of books were lifted more or less wholesale from ancient Chinese documents, some of them more than 2000 years old. These days, I compose them to fit the plots, but I still closely follow themes and concepts from early writings. Liz has her finger on the pulse of the current readers' obsessions with vampires and ghost stories. That category has become huge in the past decade, with the Anne Rice novels, Buffy the Vampire Slayer, and more recently a mega-hit called Twilight. A CASE IN POINT: I heard that Dale Peck has just sold a book on similar themes to Atria, a US publisher. The deal was handled by Endeavor, a top US literary agency. The manuscript is called Body Surfing, and is about a race of demons who jump from body to body "through sexual release". The book centres around the efforts of a female demon-hunting who is determined to wipe them out. TALKING OF ENDEAVOR, a Hong Kong group with which I am involved sent a script and script-bible for a children's TV series yesterday to that very agency. One really good thing about writing TV scripts: there is no question of authors being prima donnas. Everything is done in groups, and reviewed by members of the team. It's actually a much healthier way to work than in the lonely splendor in which book authors work. To some people, team-writing may seem like a potential source of disputes, but the gang I worked with were really fun people and we were all flexible enough to work together well.